From Fat to Fit Chick: : Eat more to weigh less! 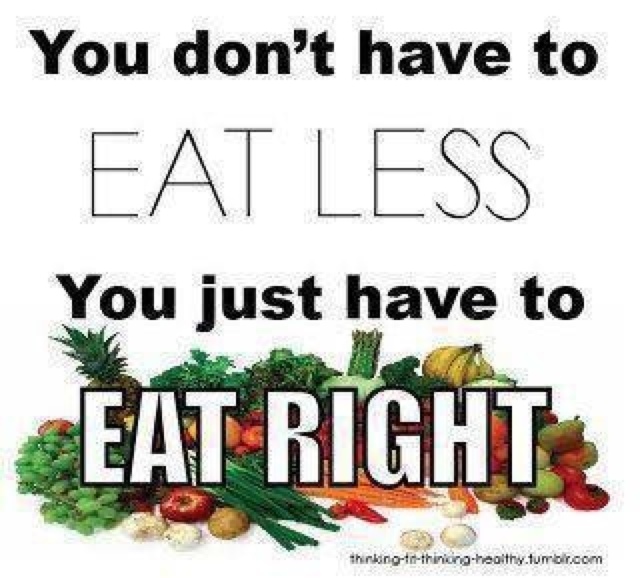 Thinking you have to starve yourself is the biggest misconception there is out there when it comes to weight loss. This picture has a good bit of truth in it. Sure you can eat healthy and still gain weight *but* chances are you won't. So instead of going for the ultimate 1200 calories a day, why not go with more and then slowly lower it down to suit your needs if you have to? 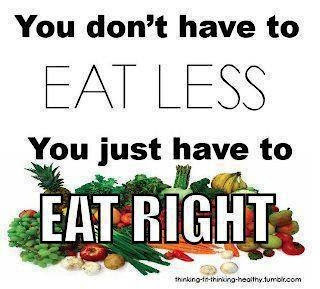 Besides....being uber restrictive in both what you are eating PLUS the amount can set you up for failure. Some people call it "starvation" mode. I just call it "Just EAT before you eat someone". So what do I do? I eat high volume foods. Like fresh veggies. Lots of veggies. These fill your belly without overdoing it on calories & give you what your body needs. I'm a believer of volumetrics. I'd rather eat an apple instead of drinking apple juice. The apple itself is filling because of the water, skin & meat, where the juice isn't. Know what I mean? Honestly, I am not super strict on my calories, it's a good thing I semi-low carb it. Just know what I'm about to list is what I actively lose weight on. Lunch - 2-3 cups of mixed lettuce, 1 whole boiled egg, 1/4 cup cheese, 1 can small shrimp, 2 tbsp of ranch dressing or maybe a protein like baked fish and 2 cups of sauteed veggies. It's all filling, except for the ice cream. Ha!